We’re about to be inundated with cauliflower. I’m afraid it’s all my fault. As I looked through the seed catalogue way back in July, I saw ‘Cauliflower Orange Bouquet F1’. I ordered it, of course. Never mind that I already had half a packet of ‘Snowball’ left from last year, and we don’t eat all that much cauliflower. And then, because I can’t help myself, I planted both types this spring. 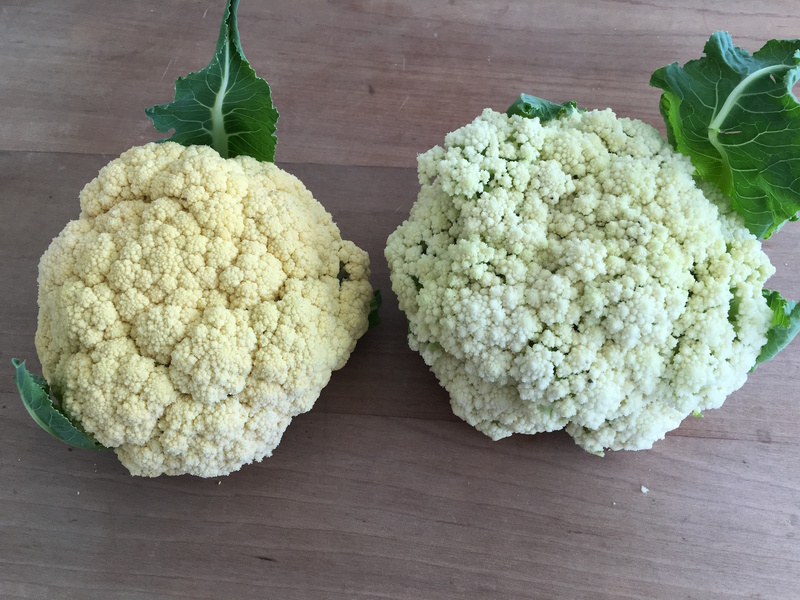 After all, if orange cauliflower would look good, then orange and white cauliflower would look better, right? Now I’m looking at 20 cauliflower plants all coming ready at the same time. That wouldn’t be too bad, if I had my beautiful orange and white colour combination. Unfortunately, Orange Bouquet has turned out to be a sort of weak yellowish colour. If you didn’t have the two side by side, you’d be hard-pressed to tell the orange from the white. The orange is every bit as delicious as the white, and the heads are big and compact. There’s nothing at all wrong with it. But it is a bit disappointing. I see in the catalogue there’s another variety—’Violet Sicilian’—now, that would be something! Think how all three colours would look together!